So now I’m not just a affiliate marketer, I’m a facebook application developer! Ok, ok, my coder Wira did all the hard work, he’s damned good when it comes to FB apps, even though he’s only recently started, after “having his arm twisted” by me to try. 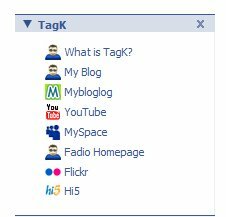 Last week we launched the TagK Social Profiles Facebook App, so if you want to link to all your other social site profiles, sites or blogs then grab the tagK app and get going! and don’t forget to invite all your friends to become users too!